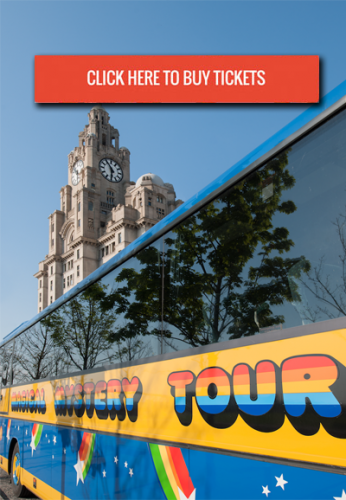 Tours start at the Albert Dock – meet your guide at the Magical Mystery Tour Ticket Office in Anchor Courtyard just a few metres from the bus stop where you will get on board the colourful Magical Mystery Tour coach for an unforgettable 2 hour tour. See the Beatles childhood homes, schools and colleges and get up close to places that inspired some of their most memorable songs – Penny Lane and Strawberry Field CLICK HERE FOR FULL TOUR ITINERARY. You’ll be kept entertained along the way by one of our professional Beatles Guides and some Fab Four tunes. The tour finishes at the legendary Cavern Club where you can enjoy live music every afternoon from the Cavern’s resident musicians. Your tour ticket also gives you free general admission to the Cavern Club in the evening of your tour date. Please note this does not include entrance for ticketed shows in the Cavern Live Lounge so check what’s on. Large parties will be admitted to the venue at the discretion of the door staff. At busy times we cannot guarantee entrance. Exclusive private tours are also available for groups or individuals for 2 or 4 hours in one of the Magical Mystery Tour vehicles or we can book a guide to join your own minibus or coach to take your group on a tour. Tickets are £19.95 per person. Group ticket for 10 also available. Tours depart regularly from 10:00am daily. More tours are added during busier times. Check times and ticket availability for more information. Please note there will be no tours on 25th, 26th December, or 1st January. Click here to check tour times and ticket availability. Printed translations of the tour are available in Portuguese, Russian, Chinese, French, German, Italian, Japanese and Spanish for just £1 per copy at the Ticket Office. Car parking – Liverpool ONE, Liverpool L1 8LT is just 5 minutes walk from the tour start and finish points. Toilets – the majority of the tour is through the suburbs of Liverpool and there are no public toilets en route. There are toilets at Britannia Pavilion, Albert Dock before you join the tour or at the Cavern Club at the end of the tour. All tours operated by Cavern City Tours are with an official Liverpool Beatles guide.